Which Satellites Am I Using? Discussion in 'SiriusXM 2.0' started by trvsnbl, Jul 23, 2018. Hello everyone, this is my first post here, sorry if this question has been answered or if I'm posting in the wrong section or something. Recently I've taken to 'collecting' satellite radios, but I dont really know how they work. From what I've read it seems that the newer radios (SiriusXM) use the XM satellites. So do the older Sirius radios now use the XM satellites as well, or are they still using their original satellites? Also, I saw another post here about Sirius service ending in 2022. I believe this answers my above question, but I was wondering if someone could expand on this? My radios so far are Sirius Stiletto SL10, Stiletto SL100, and two SXM Onyx Plus, and an Onyx EZ. I was considering purchasing a stiletto 2 and an Xmp3i but after seeing the other post I'm worried that the stiletto 2 will stop working in 4 years. The radios are more for collection than for actual use, but I don't really want them if I don't at least have the option to activate and use them if I wanted. New radios are for XM only. I think the long term plan is to get rid of Sirius side and expand the channels but I have never heard a date. Perhaps 2022 would be a reasonable one. Odds are most Sirius radios would be beyond end of life by then. Welcome to the DRC trvsnbl. Generally, radios from Sirius run on the Sirius satellites, that will eventually be decommissioned. I don't know if the 2022 date is set in stone, or if it's a rumored date that keeps getting repeated. The newer SiriusXM radios run off of the XM satellites that still broadcast to the older XM radios. You should be able to sort out which ones run off of which frequency using that method. YOu should also be able to connect each of your radios to an antenna and at least listen to the free preview channel for each. It might be a good thing to do anyway just to make sure that the radios are working when you get them. Every now and then, you night even find a radio that hasn't received the deactivation signal. You might be able to listen for a while without a subscription before it gets sent again. You can also check out the TSS Radio website to reference each radio against it's broadcast platform too. Off the top of my head, if you got the preview channel on channel 1, it was an XM radio. If you got the preview channel on 184, it was a Sirius radio. At one time, the Sirius satellites flew in a figure 8 pattern over the weekend hemisphere. Two would be turned on and flying over North America from the Gulf of Mexico to the NY area, over part of Canada and then in a south/east direction back towards Texas. The third would be turned off and finishing the figure 8 over South America. Meanwhile, XMs satellites (nicknamed "Rock" and "Roll") were stationary above the southern USA. But yeah, the SiriusXM and "2.0" radios are better, IMO. You get more features and more channels. The downside is that someone would probably pay more for Howard, since he seems to be on a Sirius channel...or something like that. With my Onyx, I need to pay for All-Access, which also gets me the online stuff. If I just had a Sirius radio, it's my understanding that I could still pay $12.95/mo plus taxes and fees and get Howard...but I wouldn't get anything online. And yeah, you can get lucky with "free" listening. One trick was to unplug the radio during cancellation and keep it unplugged for about a week. You'd then be able to listen for free until it was randomly turned off. I did this at least once, IIRC. trvsnbl and Aaron like this. Thank you everyone for your feedback! Happy to learn more about these radios. Looks like most of your questions were answered, happy collecting! I used to have a big ole collection, I would buy and resell and fix ebay radios and ones from garage sales. I had huge amounts of older party radios like the xact xt7 and starmate, JVC 1000's and starmate replays. Most of those were ones I actually used on a regular basis, i remember i had bought a collection of like 4 JVC's with home docks and everything, all were activated and worked until the day I resold them 4 or 5 years later. Never paid for the service. The Xacts were good for that too. I still have a stiletto 100 and Stiletto 2. the scroll wheel on my SL2 is busted but otherwise still works and receives a signal, as does the SL100 which I still use daily. I had 10 or so stilettos of varying types at ones point that I used to repair (usually just restore/delete firmware or get new batteries). My original Stiletto 10 I took apart after I got my New SL2 just to see what was inside and i ended up destroying it for fun. Have fun, I know I did when I first got in to satellite radios! I wish I hadn't pawned my Lynx, that was one of my favorites that I didnt spend much time with. My newest edition just arrived in the mail today! Not pictured are the home docks for each radio, along with SLEX1 and SXSD2 speaker docks/boomboxes/whatevers. Both Stilettos and the Onyx EZ are active, presumably from never getting the disconnect signal. The Lynx is active on my subscription that I just transferred from one of the Onyx Pluses(two because I had one and one came with the SXSD2). MadisonRadio1, IdRatherBeSkiing and HecticArt like this. "trvsnbl." I think I saw that on an eye chart at my optometrist's office. Anyway, SiriusXM has operated ten satellites. You can get details on each one, and be able to track them, at XM and Sirius satellites -- although the list omits the XM-4 satellite and includes Indonesia's ill-fated Telkom 3. Don't ask me why. Sirius currently uses satellites FM-5 and FM-6. 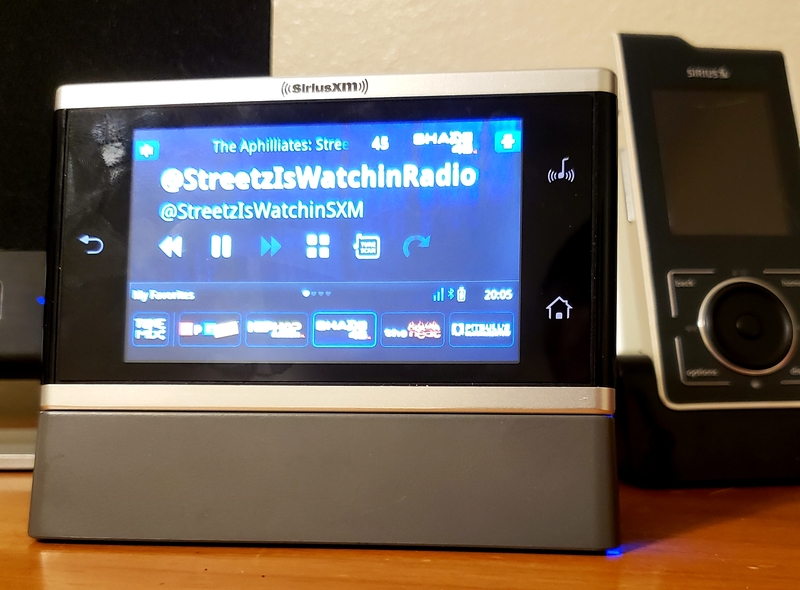 SiriusXM uses XM-3 and XM-4, which will be replaced, respectively, by SXM-7 in 2019 and SXM-8 in 2020. There is also a "spare" satellite, XM-5, that can be used by either service if one of the other four satellites becomes disabled. "trvsnbl." I think I saw that on an eye chart at my optometrist's office.